The two most important stages of a woman’s life are becoming a bride and becoming a mother. Both mark a milestone and a new birth for a woman. These two phases of her life not only bring in a change but also gives her a new identity. Well, without a doubt, the wedding day is the most special day for a woman; however, it becomes even more special when she is exchanging vows along with a junior inside. If you are a pregnant bride to be, choosing the right dress, keeping in mind your baby bump is very important. You either have the choice to flaunt your bump or hide it depending on your comfort. 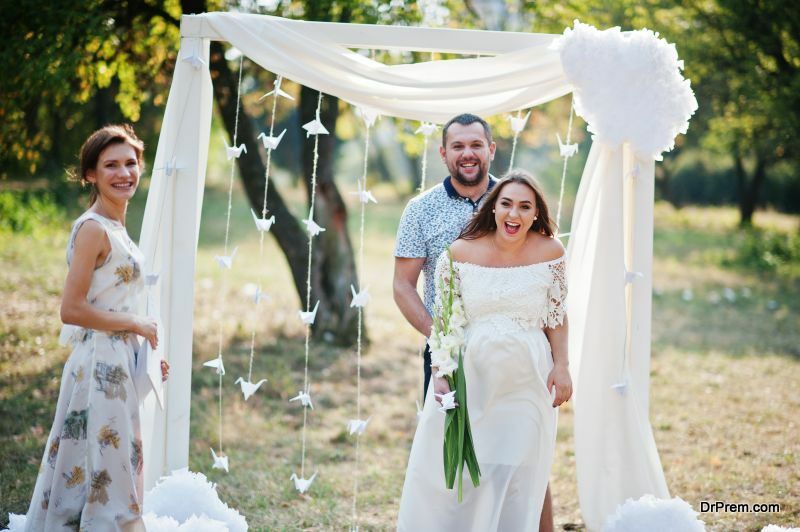 Before taking a look at some of the options you can consider for your big day, let us look at a few tips to help you decide on theright wedding dress to hide baby bump. The first factor that you need to look at is the style and shape of the dress. This is important, as this will determine how comfortable you are while wearing your wedding gown. Since you are pregnant, you need to insure that the fabric is styled perfectly to flow over the bump easily. If you are fine with flaunting your bump, you can choose a style that highlights it; however, a little free flowing design will also help to cover the bump. Also, pay attention to the chest region, depending on how far your wedding date is, you can choose a chest size that is an inch or two extra for a comfortable fit. Your style and shape will also depend in which trimester of pregnancy you are. Considering that every fabric has its own properties and ability to stretch, it is always advisable to take one size extra. A very stiff fabric will not only be a little uncomfortable, you will also look a little fat in it. On the other hand, slinky and free lowing fabrics are easy to drape and have a better flow and fall. You also need to ensure that length of the dress should be proper since during this time it is not advisable to wear heals. You can consider a dress that is right up to the ankle or that matches the length of your height. Your wedding dress should blend in with the type of accessories that you are planning to wear. Although heavy and chunky accessories are not advisable, but if you feel, you can carry them off then you should surely consider them. The accessories should not overpower the design of the dress otherwise it will be a disaster in the making. Similarly, a very subtle look may not give you the look that you require, making you very bland. It is always best to select the accessories based on the design and neckline of the dress. The print or motif of the dress also plays a vital role when you are choosing a wedding gown. Although most wedding gowns are made of plain fabric, however, there will always be some work done either on the neckline, chest, back or even on the vail. While choosing a maternity wedding gown, you have to ensure that the print you choose should be easy to carry. This not only holds importance in uplifting the look of the gown, however, it is also important as this will determine the type of cut, style, drape and other such factors that are considered while designing the gown. Empire silhouettes are definitely the way to go for maternity wedding gowns. With its ability to gracefully disguise the stomach area by emphasizing on the bust the general shape of the gown helps to elongate the body’s length too. For those that are in the early stages of pregnancy, the A-line dresses or scoop silhouette dresses could also be possible choices. Almost all maternity bridal gowns have been designed in these styles and if you are on a lookout for such gowns, here is a comprehensive compilation of the best yet most economical ones available out there. Adding a feminine glamour in the most elegant and sleek manner possible is this gentle ivory chiffon full-length, Grecian style gown. A well-defined sweetheart bodice made of pure silk satin has been overlaid with silk chiffon layers. The twist effect over one of the shoulders has been creatively made with the asymmetric strap. A streamlined finish has been provided for the invisible zip at the back and a luxurious satin sash drapes at the waistline. This dream dress is sure to ensure many a moist eye during the ceremony and even after it. This could prove to be the most romantic maternity gowns of the season! At least that is what Marie Claire feels as they voted it among their top ten dresses of the year. The best part of this gown is that it gracefully displays the gorgeous curves at the right places. The stunning and aesthetic neckline has been created with a gently curving V-neck bodice. The 3/4 length sleeves have been created out of lace with a scalloped ending. The full-length flowing skirt offers a magnificent drape with a slim fit which is ideal for all stages of pregnancy. The beauty inherent in simplicity has been exploited in the creation of this butterfly styled wedding gown. The flowing and fluttering flaps create the illusion of slimness and this would be a perfect gown for those in advanced stages of pregnancy. The empire silhouette, the elegant strapless neckline, the superlative quality , shining satin and the creative slit in front add to the specialty of the gown which is wearable during summer, fall and spring. Sweeping the floor, you could be the bride that will sweep everyone off their feet with this gorgeous chiffon gown that features a sweetheart neckline. Parading the empire silhouette, the gown comes in 28 shades and in all standard US sizes. The uniqueness lies in the exquisite beading bodice that has been handmade. An elegant chapel train adds further beauty to this gorgeous gown. Keeping in mind the kind of brides that will be wearing it, the waistline has purposely been kept high. Whether it is spring, summer or fall, this maternity gown would fall gracefully from the body of any bride. Made entirely from chiffon, the gown is thin and delicate and has a lot of intricate detailing that has gone into making it. The faint shimmer and gentle weave of the fabric lends a romantic glow to it. The neckline is the sweetheart type ( what else could be better for a romantic wedding?). The tulle straps have exquisite appliques. The bodice has been covered in lace and there is a nice decoration made with a ribbon sash. This is a very simple yet elegant wedding dress. Being strapless, it assures a super slimming fit. A hidden stretch and proper support for the bodice make it a comfortable fit for pregnant brides. A fabulous full skirt made of silk seems to flow gracefully from the high waist onward. The gown has been completely lined with a premium ivory bridal lining. A detachable silk sash in ivory is available separately. The dress has a discreet zipper at the back. One look at this gown and anyone would be amazed at the strength that the fine and thin chiffon silk material possesses. More than that, the grace and glamour that it embodies will surprise many! With a square neckline that adds length to the neck, this gown features an A line silhouette or an empire silhouette. It has been fitted at the hips and the skirt falls gracefully below. The specialty are the beautiful sleeve caps that decorate the dress. Available in nine different and romantic colors, this sheath silhouette wedding dress falls extra long and sweeps the floor as the bride glides down the aisle. The small cap sleeves add romance and appeal to the gown which has embroidered decorations along the top edges. A scoop neckline has been adopted for the dress which hugs the body from the bust to the hips before the graceful skirt begins. This means that brides in advanced stages of pregnancy better keep away from it. Like all wedding gowns, this too has a zippered back. For those that are a bit top heavy, this A line wedding gown will be a perfect fit even in advanced stages of pregnancy. A scoop neckline has been adopted for this gown that falls long. The entire dress is smooth and silky, being made of satin. Available in 9 colors and all sizes, this princely gown is available at a real economical price. This plain and simple looking gown impresses with its elegant design. The halter design has been creatively employed for this maternity wedding dress and the crossing straps above the bust lend a unique and romantic look to the dress. The dress is available in a range of colors that number more than twenty and in all the UK standard sizes. The empire silhouette and multiple layers of the skirt are sure to make the bride look irresistible. Getting married, need bridal accessories!